Financial support is essential to continue our activities. Be one of our sponsors now! Develop your talents. Experience the fun. Gain new friends. Share our dreams. Our History to 1,100 Years Back. San Pablo City is the home of the famous Seven Lakes. Take a sneak peek and see what the city in the midst of nature has in store for you. Feel the history, the culture and the pride! Join the online forums. passing it on to those who awaits. 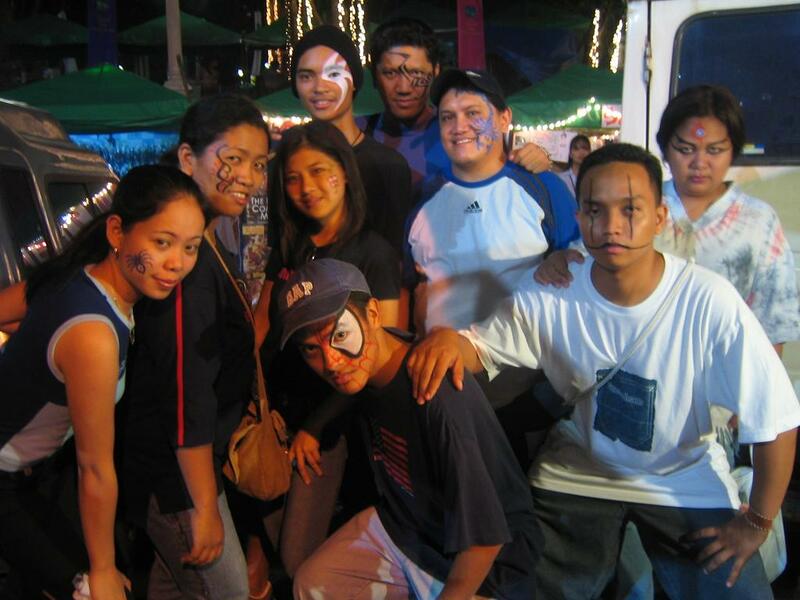 Some members of the Core Group, after a meeting and workshop assessment of the recently concluded theater camp (see related article below), went to the Market by the Lake on the night of October 31, 2004. They checked out the first-ever cultural-oriented trade fair in San Pablo City, and got the chance to visit the art exhibit in the Komikero booth. The cultural trade fair was one of the highlights of the Festival of the Seven Lakes. Thanks to Mr. Jerry Alanguilan for taking our photo after having face-painted by their resident artist! T anghalang Laguna (TALA) is a theatrical community-based organization whose ideals and principles are rooted in our desire to create a group of young performing artists advocating a society that is aware of its cultural origin. Founded on April 3, 1998 in San Pablo City, Laguna, TALA is never ceasing to extend its service to the community through workshops, performances and consultations. TALA is a non-sectarian and a non-partisan organization whose stance shall always be geared towards the preservation of our identity and dignity as Filipinos. Where are the youth who will consecrate their golden hours, their illusions, and their enthusiasm to the welfare of their native land? Where are you, youth, who will embody in yourselves the vigor of life that has left our veins, the purity of ideas that has been contaminated in our brains, the fire of enthusiasm that has been quenched in our hearts? We wait you, o youth! Come, for we await you! This page was modified last Saturday, September 20, 2008.